The regal coronation ceremony has begun for Claressa Shields the newest addition to the prestigious members of the undisputed club. Now there are two. In female prizefighting’s first true mega fight Shields showed the world with an overpowering performance that she indeed is the true middleweight world champion, bar none. For many casual sports fans it was their first glimpse at women’s boxing and Shields was at her best. Jump on the bandwagon people. Shields is the one. Christina Hammer has to be applauded for willingly stepping in the ring against Shields to test her skills against the American two-time gold medalist. The tall German fighter could have taken the road of so many other fighters who refused fights with the Michigan fighter because of one reason or another. Hammer could have waited but like a true champion believed in herself. I wish other fighters were like Hammer who is considered among the top pound for pound fighters in the world. Over the decades there have been fighters like Hammer who had confidence in themselves and didn’t wait until they saw weakness in another fighter before accepting a match. Or what some call cherry picking. Hammer tried her best even when Shields unloaded powerful combinations that snapped her head back. She continually tried to win and used every trick picked up in her 10-year pro career including excessive holding. Sometimes, reaching out to grab Shields left her open to those speedy combinations and she was bludgeoned. If you break down what transpired in the middleweight showdown Shields gave the boxing world a blueprint for future success. She showed amazing defensive tactics and skills that have seldom been seen in female boxing except by a few. Of course there are some things Shields does in a boxing ring that no one can emulate. Those are God given. Shields has become a more complete professional fighter and under the guidance of trainer John David Jackson does not waste movement, punches or energy inside the boxing ring. She already knows how to break down an opponent and now looks to find openings for a knockout. Those will come. If allowed to fight three-minute rounds Shields would definitely have more knockouts or stoppages. Mega fights await Shields and she called out one of them in Norway’s undisputed welterweight champion Cecilia Braekhus. She also mentioned she would be willing to drop down to 154 if Braekhus went up from 147. It’s a very makeable fight. Other possibilities for Shields include Mexico’s Alejandra Jimenez the heavyweight world champion who dropped down to super middleweight because of the lack of competition at the heavyweight level. Mexico loves female boxing. Imagine a match in Los Angeles or Mexico City with Shields and Jimenez? New York’s Alicia Napoleon just recently won by knockout last week and she has a world title at 168, but actually competes at middleweight. She weighed 158 pounds last Wednesday against Eva Bajic in New York City and has never fought above 160 pounds. She’s perfect for a fight at Madison Square Garden. Or, how about a rematch with Franchon Crews? When they met nearly three years ago both made their pro debut against each other. It was the first time I had seen them both in action live and they lit up the arena. I predicted both would be world champions and that proved correct. The punches they fired and the determination they showed was overpowering. They were on the Andre Ward and Sergey Kovalev fight card and it was the best fight of the night. A rematch for 10 rounds would be electric. But Shields is now fighting at 160 and Crews at 168. So that fight might have to wait until a year or two. American female prizefighting now has its biggest star and Claressa Shields is her name. On the topic of mega fights, some other fighters that could potentially be on equal footing for another mega fight are out there. The one common denominator: all are currently on somebody’s top 12 pound for pound list. What made Shields and Hammer compelling was not just their undefeated records, but that both fighters are considered elite boxers and on pound for pound lists. Being undefeated doesn’t necessarily mean a fighter is good. Plenty of fighters have undefeated records but are not elite boxers. Our advice to promoters is to look at a list of pound for pound female boxers and match them up. Several that hit the mark immediately are Katie Taylor, Amanda Serrano, Delfine Persoon, Jessica McCaskill, Layla McCarter and Mariana Juarez. Match those with each other and you have another super fight. Later this week, ThePrizefighters.com will be presenting our favorite possibility for the next mega female fight. Nazarena Romero (7-0) defeated Marianela Ramirez (4-5) by unanimous decision after 10 rounds on Friday April 12. The South American bantamweight title fight was held at Catamarca. On Friday April 19, bantamweights Micaela Sarfati (0-0) and Antonella Molina (0-4) meet in a four round bout at Mar de Plata. On Saturday April 20, flyweights Anahi Lopez (13-0-1) and Debora Gomez (5-3-1) meet in a six round contest in Buenos Aires. Carol Earl (3-3-1) knocked out Ratsadaporn Khiaosopa (0-13) in the first round on Saturday April 13. The super bantamweight fight was held at Yagoona. Marie Eve Dicaire (15-0) was the winner by unanimous decision after 10 rounds versus Sweden’s Mikaela Lauren (31-6) on Saturday April 13. The IBF super welterweight world title bout took place at Montreal. Dicaire, 32, a southpaw, was making her first defense of the title. Cindy DeHoux (7-12-1) was the winner by unanimous decision after eight rounds versus Elise Bussiere (3-4) on Saturday April 13. The French featherweight title fight took place at Loire. Laetitia Arzalier (13-1) beat Snezana Siljkovic (1-3-1) by decision after six rounds on Saturday April 13. The flyweight match was held at Herault. Marine Tollet (1-3) won by majority decision after four rounds against Valerie Joseph (0-1) on Saturday April 13. The featherweight bout took place at Essonne. Laura Griffa (19-2) defeated Segolene Lefebvre (11-1) by unanimous decision after 10 rounds on Friday April 12. The IBO and WBF super bantamweight title fight took place Nord. Also, Laetitia Chevalier (4-0) beat Aleksandra Vujovic (4-10-2) by decision after six rounds in a super lightweight fight. Amira Hamzaoui (12-2-1) was the winner by decision after eight rounds versus Ivanka Ivanova (1-10-2) on Friday April 12. The bantamweight bout was held at Epernay. On Friday April 19, lightweights Victoire Piteau (1-0) and Helena Claveau (0-0-1) meet in a four round bout at Herault. Maria Lindberg (17-4-2) defeated Mariam Tatunashvili (3-10-2) by unanimous decision after six rounds on Saturday April 13. The super welterweight match took place at Luebeck. Arely Mucino (28-3-2) was the victor by decision after 10 rounds against Yairineth Altuve (10-3) on Saturday April 13. The WBO flyweight world title match took place at Monterrey. It was her second defense of that title. She also held the WBA, WBC and IBF versions. Marina Dekic (2-5) defeated Jovana Trifunjagic (3-7) by technical knockout in the first round on Friday April 12. The bantamweight match was held at Becej. Kirstie Gannaway (2-0) defeated Nadya Nakhoir (0-6) by decision after four rounds on Friday April 12. The super flyweight match took place at Singapore. Also, Efasha Kamarudin (3-0) knocked out Febriyanti Lubis (1-4) in the first round of their flyweight fight. Ji Hyun Park (24-3) was the winner by unanimous decision after 10 rounds with YuFei Wu (1-1) on Saturday April 13. The WBF minimum weight title took place at Bucheon. On Saturday April 20, bantamweights Soo Rin Kim (3-0-1) and Yukimi Kasajima (0-0) meet in a four round bout at Goyang. Loetizia Campana (4-5) knocked out Chuleeporn Konthon (0-1) in the second round on Thursday April 11. The flyweight fight was held in Bangkok. On Friday April 19, lightweights Natasha Jonas (7-1) and Bianka Majlath (3-1) meet in a six round contest at Liverpool. 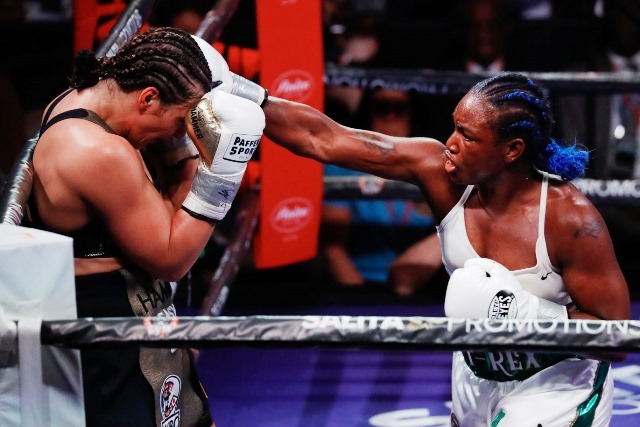 Claressa Shields (9-0) won by unanimous decision over Germany’s Christina Hammer (24-1) on Saturday April 13. The middleweight world title fight for the WBA, WBC, IBF and WBO belts took place at Atlantic City. The win makes Shields the undisputed world champion. Only one other female fighter, Cecilia Braekus, can make that claim. Also, Argentina’s Brenda Carabajal (16-4-1) defeated Elena Gradinar (9-1) to win the interim IBF featherweight world title. Alicia Napoleon (11-1) knocked out Eva Bajic (14-17) in the second round on Wednesday April 10. The middleweight fight took place in New York City.